Robbins probationary office Justin J. Jones (left) and Kendra R. Branch (right). 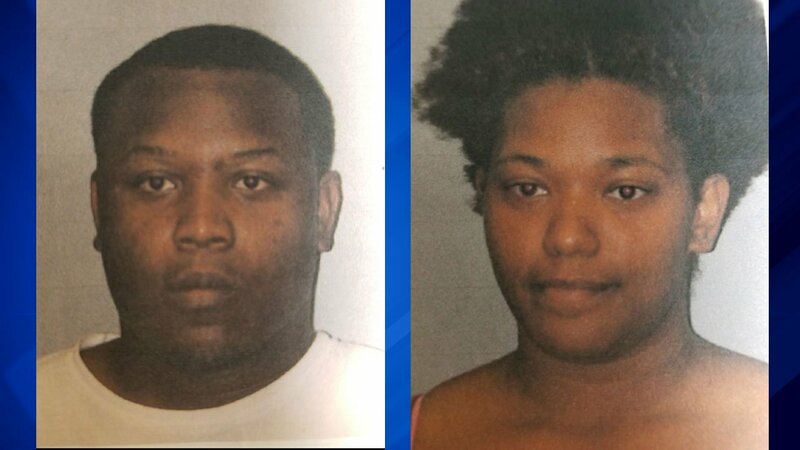 MATTESON, Ill. (WLS) -- A suburban probationary officer and his girlfriend have each been charged with disorderly conduct after Matteson police said they fabricated a story about a baby boy being abandoned in order to get the boy's mother in trouble. Police said that a woman told officers she found an abandoned baby in the 3700-block of 214th Street near the Old Plank walking trail Thursday evening. Investigators said the woman, Kendra Branch, was the live-in girlfriend of Justin Jones, who is the apparent biological father of the child and lives in a nearby apartment building. Police said Jones, a probationary officer with the Robbins Police Department, and Branch fabricated their story about finding the abandoned baby in order to get the boy's mother in trouble with the Department of Child and Family Services. Both Jones and Branch denied knowing the baby numerous times during interviews with investigators. Jones, 23, and Branch, 25, were each charged with one count of felony disorderly conduct. The Robbins Police Department has placed Jones on administrative leave and is conducting its own internal investigation. A judge set Jones' bond at $30,000 and released Branch on an I-bond Monday. The child remains in custody of DCFS, which is conducting an investigation to determine the final placement of the child.